The Diva's Weekly Challenge #252: "String Theory: Tangle within a tangle... it's like inception... but with tangles"
Arukas was the 1st tangle I thought of for tangling within a tangle plus I could slip in a little gem! Sending sunshine from down under to snow covered lands in the north. Love the jewels at the center. Lovely Tangles ! So beautiful! The black and brown tangles are already great but the combination with the yellow gem is just gorgeous! Arukas crossed my mind, too, but I decided for another one. However, your tile proves that Arukas would have been a wonderful choice, too! I love this sunny tile!!! Oh, it's so gorgeous. Arukas is one of the few tangles that I struggle with, and I never can quite get into the "Zen" mode of tangling when I draw it. Practice makes perfect, I'd say! 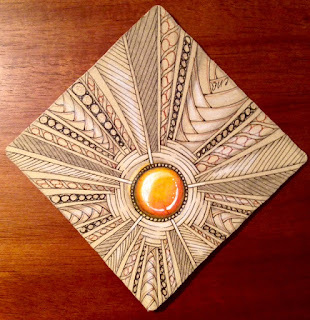 What a beautifully tangled tile you have created Michelle, the way you added the Zengem is awesome. Thank you for sharing your gorgeous work. Love the perspective. Reminds me of looking down from a rotunda and seeing the floor below. See the five simple pillars and the gem at the bottom is beautiful. Thanks for the sunshine and the lovely tile! Love your Arukas and your gem! Wonderful! Beautiful sunshine tile, with the shiny gem in the centre of Arukas. You did great about choosing a tan tile for this challenge. It has a warm glow of its own, and with your tangles on top it can only become better and warmer. thanks for bringing some sunshine from downunder! Your warm and sunny tile is most welcome! How clever to put a gem in the center! Very pretty. I do love this. 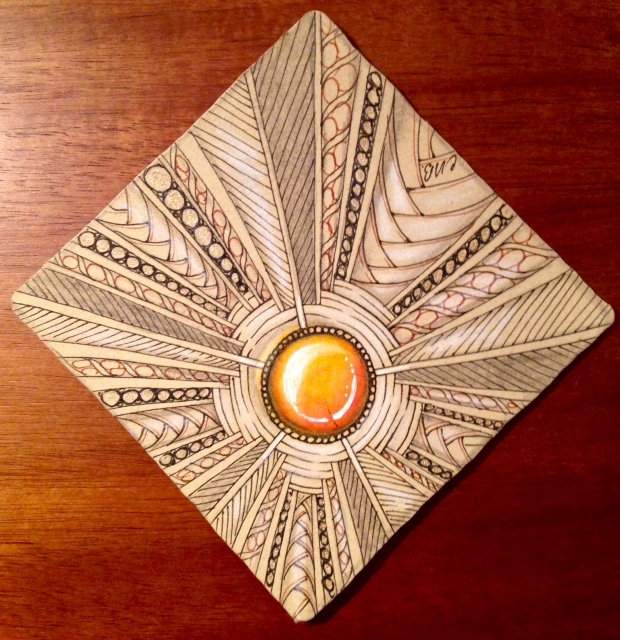 We'll take your sunshine and bask in the warmth of this beauteous tile! Love it, warm and golden. wonderful sunshine on your tile! Love it very much!